This topic contains 3 replies, has 2 voices, and was last updated by buildit 12 months ago. Purchased, uploaded, and activated version 2.85 of the plugin. Clicking Formidable PRO2PDF from the dashboard lands on a blank options page and I can’t do anything with the plugin (activate, pair fields, etc.). 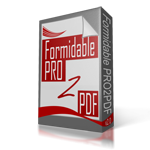 Try disabling all plugins except Formidable Forms and PRO2PDF, if the plugin works then add the plugins back one at a time to find the conflict. There is not a known or reported bug, if disabling plugins does not fix the issue we will need to take a look at the installation, please complete this form. Hi, thank you for your reply. We already tested for plugin conflicts and with all plugins deactivated, we are still encountering the same issue. Also, we found the following other support threads that appear similar to ours but I don’t see any consistent resolution. I will submit credentials through your other form now. Also, is it possible that specific PHP modules are necessary for this plugin to work? Additionally, is this plugin compatible with PHP 7?